For the most part, things just worked. I’ll paste the entire code base below. The only real issue I ran into was formatted. 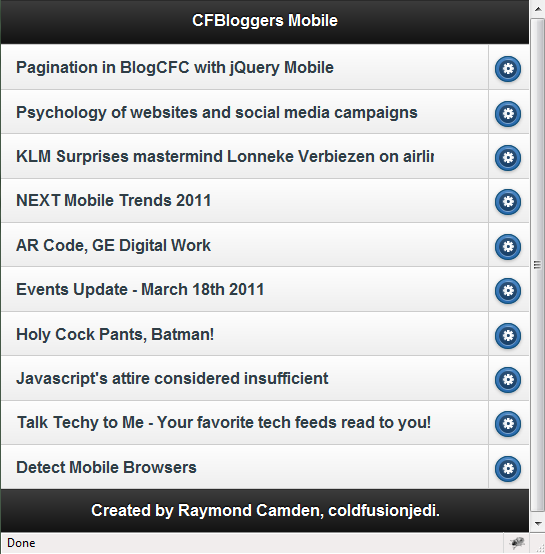 Some RSS feeds included HTML that broke jQuery Mobile a bit. I do some string manipulation to a) replace HTML breaks with real line breaks and b) remove HTML and c) return the line breaks back into HTML. I got some help from Scott Stroz on this as well. But to be honest, that was the biggest technical issue. Check out how short the code is below. First, the home page. And this is the display page. 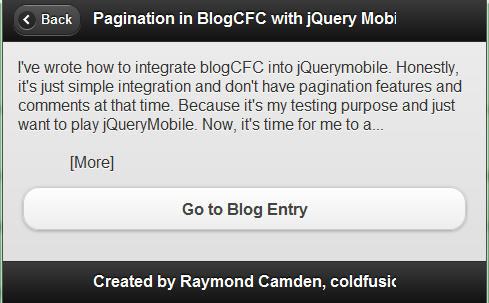 There is more I'd like to do - specifically pagination, maybe search as well. Any suggestions would be welcome!